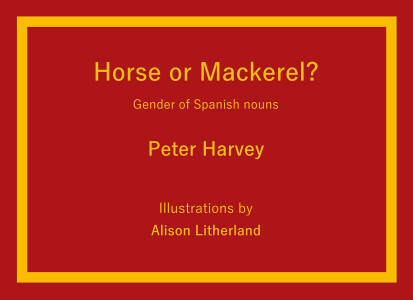 Lavengro Books breaks new ground with a title intended for people learning Spanish. 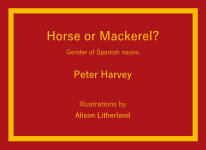 Horse and mackerel are respectively caballo and caballa in Spanish. The similarity of such words can be confusing, especially for English-speakers. The book also looks at differences such as el orden (arrangement) and la orden (command) and words that can easily be confused such as cuna (cradle) and cuña (wedge) and words that are distinguished by accents such as si (if) and sí (yes). Every English fact at your fingertips … a more than handy reference tool for all involved in imparting linguistic knowledge on a regular basis. In the author’s alphabetically arranged detailed content one can only admire the spirit of Dr Johnson … it will help out when dealing with potentially awkward customers, or those keen to try out a new teacher. This book is essentially a compilation of what I have taught my students in the course of my career teaching English as a foreign language. 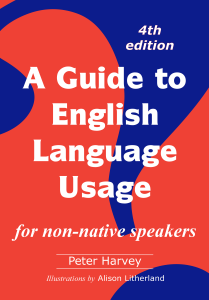 As its title says, it is a guide, in dictionary format, to the way in which the English language is used in circumstances that of the language are likely to encounter. It is specifically written to meet the needs of non-native speakers. I started teaching in 1978 and for very nearly all of that time I have been time teaching adults. I came to live in Barcelona in 1984 after working in Germany, Zambia and Saudi Arabia. The book is presented in dictionary format; I cannot deny – in fact I readily admit – that Fowler’s Modern English Usage has been an inspiration for my book both for the format and for the style. One kind person who read the book in its draft form said that it was Fowler for Foreigners. Whether or not that extremely flattering description is even partly justified is hardly for me to say, but I do know both from my own experience and from what other people involved with language teaching and with multilingual work have said, that while Fowler is an excellent book, especially in its third edition revised by Robert Burchfield, it just does not work with non-native speakers; it does not contain much of what they want to know because it is assumed that native speakers know how to form and use the various ways of expressing the future in English; the controversy surrounding linguistic engineering matters less to foreign users of English than its practical consequences; and the subtle distinction between sentinel and sentry is of little interest to almost all of them. This is a reference book, not a text book. It is not intended for regular classroom use. It does not contain any exercises. As with Great English Mistakes I am extremely fortunate to have Alison Litherland as my illustrator. Her drawings certainly add to the entertainment value of the book, making it more fun to browse; but they also add impact to its pedagogic aspect by making the content of the text more memorable. The book has 422 pages, 973 articles, either 189,978 words and 69 line drawings by Alison Litherland. A Kindle version wil be available later in 2017. As its subtitle says, it is for non-native speakers of English. With that I deliberately do not say students, though upper-intermediate and advanced students (and perhaps even their teachers) will certainly find it useful. I have more in mind. I know that there are very many people all over the world who need to use English in the course of their daily life as professional people, as businesspeople, or as students of subjects other than the English language. These are people who expect to have constant access to a dictionary but find that that dictionary does not answer all of their queries, at least not in a way that a non-specialist can easily understand. It is my intention that people who expect to have a bilingual dictionary of English and their own language on their bookshelves will want to have this book beside it. The contents of this book fall into three basic categories, although it is presented as one continuous dictionary. There are detailed grammar articles covering such topics as verb tenses, modal auxiliary verbs, the use of articles, tag questions, etc. Some vocabulary items are included: for example above and over, and why draw seems to mean so many things, and all the various words that mean hit. There are articles that present cultural material from a language point of view: law, police, Christmas contain the words that are associated with these topics, presented in a coherent text form. The book contains phonetic transcriptions of the pronunciation of many words in the symbols of the International Phonetic Alphabet, and it also describes the pronunciations of Keats and Yeats, and of John Maynard Keynes and Milton Keynes. On the fifteenth of October (or thereabouts) 1990, as I sat teaching a Proficiency class in Barcelona, while the students were coming to terms with the fact that a British mayor is quite a different thing from a Spanish alcalde, the idea of writing a usage guide to the English language first came to my mind. After several stops and starts, not least because I had to work and earn money, I took it up seriously in November 1999 with the first of what was to become a series of weekends once a term in the peaceful atmosphere of Queens’ College Cambridge and the book was essentially completed in 2002, having acquired a size and scope that were far greater than I had originally planned. However, for various personal reasons I then had to leave it for a year before I could start marketing it. I approached a number of EFL publishers, who were very polite and enthusiastic about it in principle, but informed me that it did not fit in with their programmes. 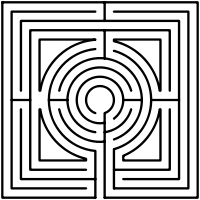 It seems that publishing companies are like ocean-going liners or oil-tankers; once they are in motion, diversion from the planned route is impossible. Oxford acknowledged my proposal by return of post and rejected it a few days later because, despite its evident quality, it did not fit in with their schedule for the next few years. Another very large and very important University Press, which I prefer not to name, managed to lose the copy of the draft that I sent them. When I found this out some three months later, I re-sent my proposal and they declined it promptly, suggesting the name of a smaller publisher that I might approach; that came to nothing. The director of one publishing company, Summertown Publishing in Oxford, even rang me from Britain on the very day that he received my book to tell me that he was extremely impressed with it, and that he sincerely hoped that I would find a publisher for it, but sadly it just did not fit in with his company's programme and regretfully he had to decline it. On the other hand, I thank him sincerely for taking the trouble to reply promptly - or indeed at all. I have found that not all publishers are so courteous. In view of all this, I decided to go for self-publication in electronic format. This meant that I had to do for myself all the proofreading, layout and other tasks that a publisher would normally do for an author, as well as inserting all the cross-references, preparing the index, and keeping the text up to date. This took time. A friend persuaded me to look at print-on-demand (POD) for simultaneous production of a printed version, so I produced a second edition is a format suitable for printing. Negotiations with one e-book and POD publisher came to nothing, but took a long time to do so. I had serious hopes that the book would appear in early 2006 but things always take longer than one expects. Finally, I found a POD printer in Spain who offered the service that I wanted and I set up as a publisher myself and took delivery of the first printed books in March 2007. Then an extraordinary series of problems and tragedies in my family delayed the launch until early in 2008. I look with pleasure on my book, however defective, and deliver it to the world with the spirit of a man that has endeavoured well. That it will immediately become popular I have not promised to myself: a few wild blunders, and risible absurdities, from which no work of such multiplicity was ever free, may for a time furnish folly with laughter, and harden ignorance in contempt; but useful diligence will at last prevail, and there never can be wanting some who distinguish desert; who will consider that no dictionary of a living tongue ever can be perfect, since while it is hastening to publication, some words are budding, and some falling away; that a whole life cannot be spent upon syntax and etymology, and that even a whole life would not be sufficient; that he, whose design includes whatever language can express, must often speak of what he does not understand; that a writer will sometimes be hurried by eagerness to the end, and sometimes faint with weariness under a task, which Scaliger compares to the labours of the anvil and the mine; that what is obvious is not always known, and what is known is not always present; that sudden fits of inadvertency will surprize vigilance, slight avocations will seduce attention, and casual eclipses of the mind will darken learning; and that the writer shall often in vain trace his memory at the moment of need, for that which yesterday he knew with intuitive readiness, and which will come uncalled into his thoughts to-morrow. In this work, when it shall be found that much is omitted, let it not be forgotten that much likewise is performed; and though no book was ever spared out of tenderness to the authour, and the world is little solicitous to know whence proceeded the faults of that which it condemns; yet it may gratify curiosity to inform it, that the English Dictionary was written with little assistance of the learned, and without any patronage of the great; not in the soft obscurities of retirement, or under the shelter of academick bowers, but amidst inconvenience and distraction, in sickness and in sorrow. With 102 pages, Great English Mistakes is shorter than the Guide. It is also lighter and more amusing in tone, while maintaining a seriously professional attitude towards its content. 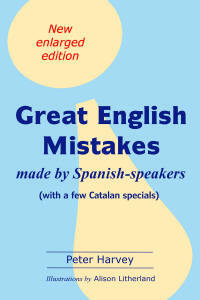 In 24 years of teaching English in Barcelona, I have a heard and read a great number of mistakes. The purpose of this compilation is to present them in a way that will make an impact on the reader, who will then learn to avoid them. Clearly, mistakes must be identified and corrected. Unlike many EFL teachers I am a linguist myself; I studied modern languages (German, French, Spanish and Russian) at school and at university, but when I came to Barcelona I had only O-level Spanish from seventeen years earlier and no Catalan at all. I know from my own experience just how hard it is to learn a language, and how hard it is to eliminate mistakes. My attitude to people who make the mistakes is sympathetic. But with the mistakes themselves I am uncompromising: I identify them and I correct them. This book is written in English, but it does not require a high language level to be understood. It is intended for a general public. 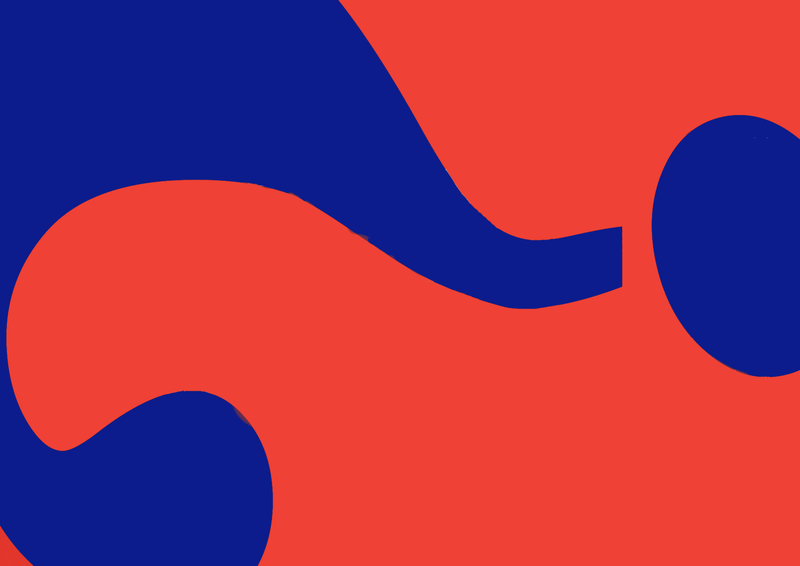 Technical terminology has been kept to a minimum (though standard phonetic symbols are used to show pronunciation) and the style is light and humorous, with anecdotes that are a true reflection of mistakes that are made by Spanish-speakers. 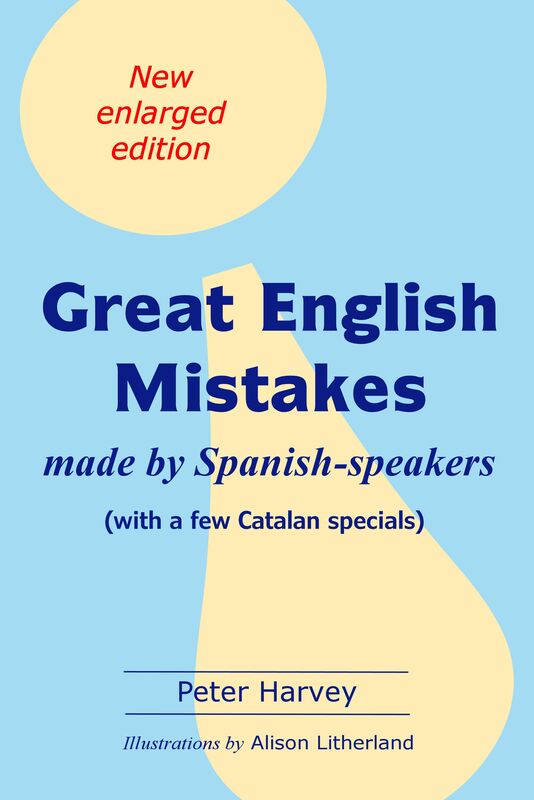 There are two pages of the typical mistakes made by Catalan-speakers. I am extremely fortunate to have Alison Litherland as my illustrator. Her drawings certainly add to the entertainment value of the book, making it more fun to browse; but they also add impact to its pedagogic aspect by making the content of the text more memorable. A Kindle version is available. Click here to see a sample of the book (pdf). As the name suggests, Lavengro Books Pearls are concentrated units of concise information averaging about 80 words each, intended for people learning English. 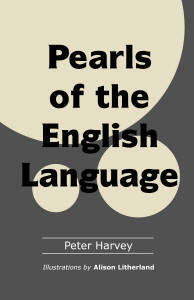 Each Pearl contains a point about the English language in a short form that is easy to assimilate and remember. The Pearls contrast with and complement the detailed descriptions contained in A Guide to English Language Usage. Click here to see a sample of the printed book (pdf).